"The things you hold dear�friends, family, lovers�hurt you the most. You live with that. That's why we have the Ether. A place of eternal peace." 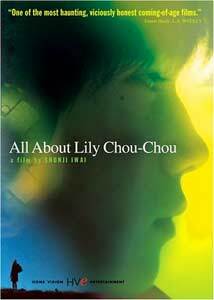 Touted on the DVD cover as a "viciously honest coming of age tale," Shunji Iwai's All About Lily Chou-Chou takes a well-tread genre and expands the limits of narrative cinema. I had to let this film settle a couple of days before I felt comfortable writing about it, but even now, I feel as though my analysis may be lacking. Like good poetry or an engrossing natural vista that one takes in for the first time, further meaning is gleaned from repeat visits. This film is akin to those kinds of spectacles�an experience, almost spiritual, that begs repeat viewings before one can reap the full benefit. It's setup is simple, and its narrative implications, complex. Yuichi (Hayato Ichihara) is a 14-year-old student, on his way to middle school. It is an important time of transition in a young Japanese boy's life, one that marks the passage between childhood and adulthood, with all the emotional trappings and struggles implied. Confused, unconfident, and without the guidance of a stable home life, Yuichi and his friends turn to petty theft and cruel games to occupy their time. Brief moments of solace are found within the "Ether," the peaceful aura communicated through the music of Lily Chou-Chou, a pop music star whose transcendent, ambient tones soothe Yuichi's spirit. He enjoys standing amidst green fields listening to strains of Lily, but despite the Ether's power, his mild-mannered, internalized ways win out. Yuichi's classmates are not much better off. Hoshino (Shugo Oshinari) begins as the teacher's pet. He is the typical intellectual, excelling in school without really trying, and getting all the ridicule that naturally follows. After his family breaks up, he undergoes a dark transformation, and tries to bring Yuichi down with him. Kuno (Ayumi Ito) is Yuichi's crush; a talented classical pianist, she too is a victim of the various cliques around school. Shiori (Yu Aoi) is the most heartbreaking of the bunch, forced into prostitution and emotional bankruptcy, despite some sunny moments of kite flying. What links these troubled youths is the virtual world of a Lily Chou-Chou online BBS, a place where ideas can be expressed and grievances aired. Its a place free from the pressures and expectations of Japanese academic life, ultimately serving as a spiritual touchtone for wandering souls. The Ether becomes a religious portent, providing the peace that the real world cannot deliver. Though Lily's ethereal voice seems to soothe, it tends to fall short of being a complete remedy. All About Lily Chou-Chou depends greatly on this virtual dialogue, but does not linger on the famed pop star. The youths' fascination with her is more of a background element, bringing another common thread to a group of equally troubled kids. This is not a film about fanaticism, but rather an ingeniously powerful tale of adolescent struggle, set against our internet-savvy modern times. Shunji Iwai's film is hauntingly luminous, filled with beautiful digital video images that simply pop with vivid color. Snippets of online dialogue flood across the screen, interspersed with black screens, images, and computer code, creating an unconventional narrative that is compelling, innovative, and visually stunning. Combined with a superb, Debussy-heavy musical soundtrack, including the affecting songs of the fictional Lily Chou-Chou, this is a cinematic experience I will not soon forget. At times indecipherable, this wll certainly not be everyone's cup of tea, but take a chance. Let the Ether wash over you; the messages will become clear, and the details, unimportant. Image Transfer Review: Home Vision's anamorphic 1.85:1 transfer shows bold colors and good detail, showcasing the film's moody cinematography. Some softness does persist. I thought this was a consequence of the digital video, but upon comparing screenshots to some other, alternate-region releases of the film, it seems this transfer is a bit lacking in sharpness. Frankly, if I hadn't stumbled upon those other screenshots, I would have been none the wiser. This is still a beautiful image, no doubt. Audio Transfer Review: The Dolby 2.0 Surround audio provides a good aural experience with plenty of ambient fill, but can sound a bit muffled at times. It has a nice immersing quality, though. Extras Review: This disc features some classy menus. I was impressed by the unique layout of the chapter selection page. The extras begin with the lengthy Making-of Documentary (55m:07s), which is broken into ten chapters. This piece takes a look at Iwai's innovative use of the internet to find new screenwriters, and to create an online novel that led to All About Lily Chou-Chou. A website for the fictional pop star was launched, causing an online dialogue that contributed heavily to the final film. Behind-the-scenes footage and production info are also included. You will also find a director's bio and filmography, a Lily Chou-Chou music video for Wings That Can't Fly and two theatrical trailers. Finally, an insert contains an essay by the director on the film's inception and execution. Shunji Iwai's opus is pure cinema that affects on a very spiritual level. It's a harrowing, haunting look at growing up in modern Japan, made immediate by transcendent images and music—a truly unique experience. Home Vision's presentation captures the mood.